Everybody knows that cops love doughnuts, wear flattop haircuts and will write speeding tickets to their mothers, right? We all have ideas of the stereotypical police officer. Sometimes, he's grossly overweight. Other times, he's ridiculously muscular and wearing a shirt three sizes too small. Police stereotypes are as common as they are diverse; some are unrealistically negative; others are in the other direction. Police are ill-tempered macho men who love guns and fast cars, or they're innocent benign Barney Fife types. They're fatherly Irishmen or hard-charging and overbearing control freaks who won't tolerate even the slightest hint of disrespect. Stereotypes of cops, both positive and negative, have been around for as long as there have been police. How true, though, are these stereotypes and where did they come from? Here's a look at a few popular stereotypes, their origins, and their realities. Probably the best known and by far the most overused stereotype of police officers is their apparent affinity for those sugary fried confections that many officers lovingly call "energy rings." This stereotype is so pervasive that many officers will refuse to park their patrol car anywhere near a doughnut shop for fear of perpetuating the belief that cops and doughnuts go together like peanut butter and jelly. Why is it, though, that this notion is so widely held? In short, it's because even today, it's not uncommon to see several police cars parked in front of the local doughnut shop. The truth behind the myth, though, has nothing to do with doughnuts. In reality, it's all about the coffee. Quite often, the only place available to get coffee or to take a break at 3:00 AM is the doughnut shop because that's the only place that's open 24 hours a day. Doughnut shops became the place officers assemble because of the coffee. It's a widely held belief that police are mandated to make a fixed number of arrests and issue a fixed number of tickets. Many people dismiss the fact that they received a ticket as just another officer trying to make his quota. Do cops have quotas, though? The answer is most cases is no. Police generally do not have set numbers of citations and arrests they must make. At the same time, though, it's easy to see where the perception comes from. The ambiguity arises in the question of accountability. Like any other job, there has to be some measure in place to ensure that officers are working. The easiest and most logical way to measure performance is to look at the number of tickets written, reports taken, calls responded to and arrests made. If one officer has issued only a few tickets over a certain period when most other members of his department have issued 100 each, supervisors may question what he's been doing with his time. Of course, this may seem to you like a difference without a distinction, but it's a significant difference. Few departments set numbers and quotas. At the same time, it's expected that officers are working and not wasting time and taxpayer money. Especially prevalent in older films and cartoons, the stereotype of the Irish cop was a popular one almost since the inception of professional policing in America. This stereotype is grounded in fact. In the early days of "professional" policing, the job of an officer was not the respected pillar of the community as some view it today. Now widely regarded as heroes, police in the early days were looked upon as thugs. They were not at all well respected. Because of this, police employment was one of the few areas where Irish immigrants were able to find jobs. Ironically, just as a majority of police officers were Irish, so too was a majority of those arrested. The van police use to transport large numbers of suspects received its derogatory nickname, the Paddy Wagon, from the perception that it was at one time full of "Paddies," -- derogatory slang for "Irish." These are a few of the stereotypes that accompany cops and criminal justice careers in general. As is often the case, realities generate their own perceptions which, in turn, beget their own perceived realities. 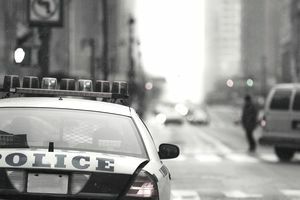 These stereotypes are often fun to laugh and joke about, but they don't adequately convey the truth of the job of a police officer or the dangers associated with being an officer. Of course, working in any criminology or criminal justice career will come with its prejudices and misconceptions. The stereotypes do not, however, diminish the value that these important jobs provide to our society as a whole.